A public art-work by artist David Adam hung in the centre of Glasgow above the Val D'Oro restaurant, Glasgow's oldest fish and chip shop at the Cross near the historic Tolbooth. 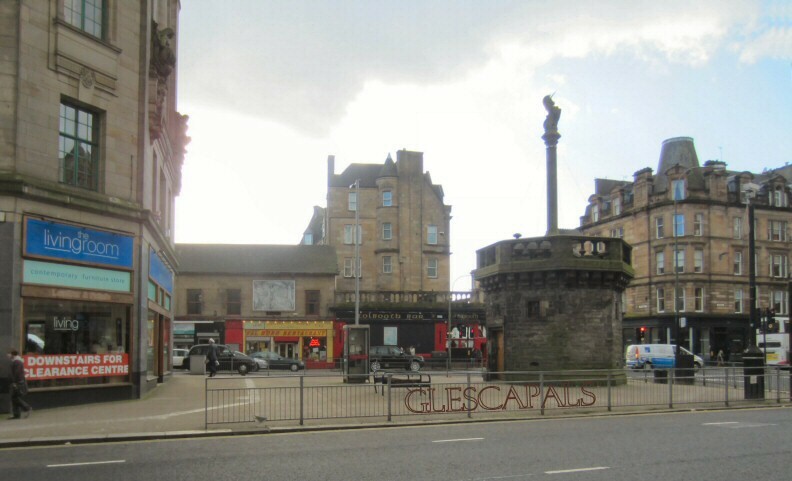 The scene is centred on the Mercat Cross looking towards the Trongate. The figure in the foreground is Peter Corvi who gave his life to serving the people of Glasgow for 50 years in the Val D'Oro. A child stretches up in a vain attempt to give Christ a drink from a bottle of iron fortified lemonade symbolising the biblical wine vinegar on a sponge. The figure on the right with a dog in the trolley is Mary P......., she wrote a touching poem about Peter when he died and this can be read in the Val D'Oro. The figure on the left outside the Val D'Oro is tenor singer Luigi who now serves there. Luigi Corvi.runs Val D'Oro, an old-fashioned chippy at Glasgow Cross.By reputation, Val D'Oro is Glasgow's oldest chippy, located since 1875 on the vague boundary where town centre blurs into east end. 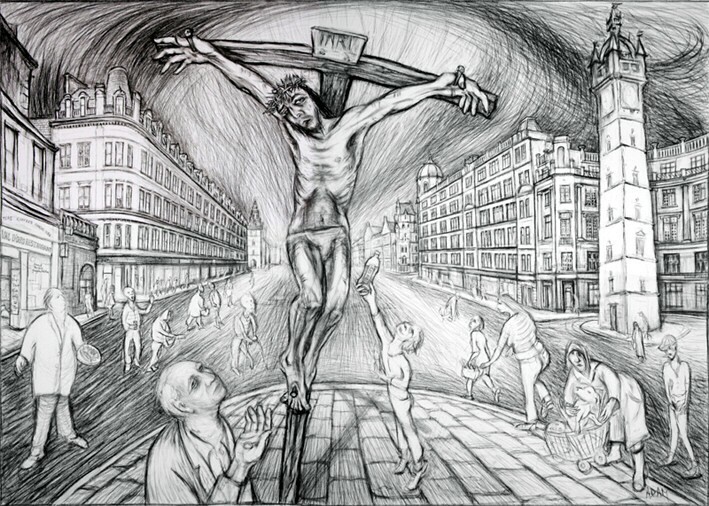 Painting by the artist David Adam, Luigi Corvi's brother-in-law, depicting Christ being crucified. It was put there in honour of the Pope's visit. Corvi is in the picture, holding a fish supper, and so is his most regular customer, Mary Paterson, who is in her nineties and has been eating at Val D'Oro for at least 70 years. It is very much a Glaswegian crucifixion. Christ, leaning out from the cross, is being offered a restorative swig of Irn-Bru. 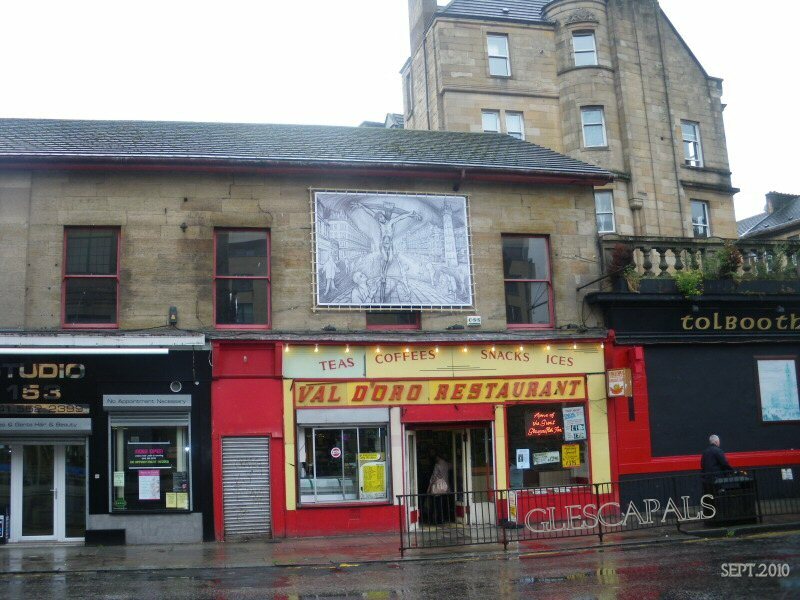 This is called The Passion at Glasgow Cross by David Adams and sits above the Val D'Oro Restaurant. 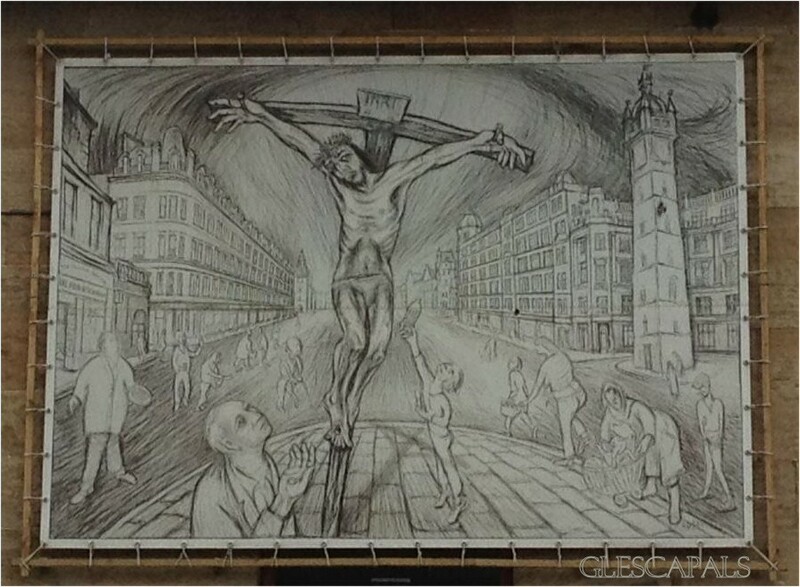 Completed in 2010 David Adam's stark image of a crucified Christ in a street scene at Glasgow Cross places Christ in the midst of the city. At the foot of the cross where Christ's grieving mother Mary traditionally stands, is another Mary, Mary Paterson, a valued customer and local character, now in her nineties, huddled over the basket in which she carried her dog Sheba. To the left of the cross, Luigi Corvi, owner of the shop, stands poised to sing, bearing a plate of fish and chips. In his innocence, a small boy offers up the remains of his Irn Bru to Jesus while a woman to his right attempts to pick the pocket of a passer-by and a man nearby injects heroin into his thigh. Val D'Oro restaurant July 2005. 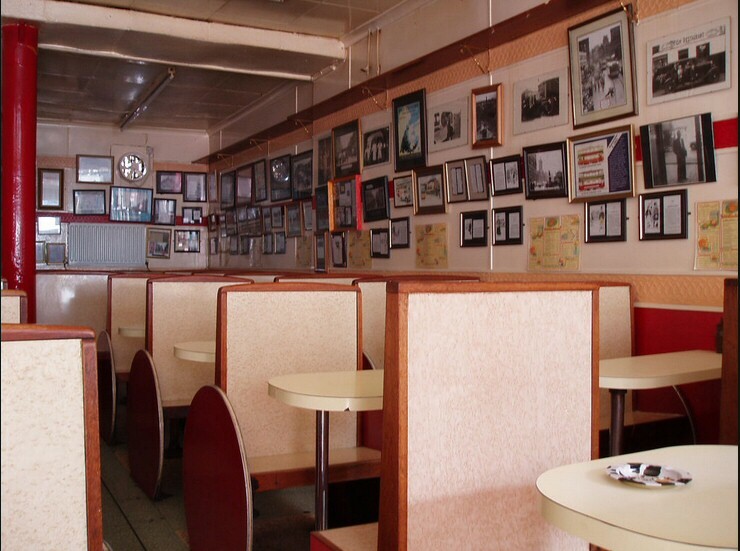 Inside, the wood and Formica tables and booths date back to 1950.